Hey everyone – this blog post is in response to an emergency request from a fellow photographer in the Firstlighters group. Shameless plug for them – hosted by Lightstalking, Firstlighters is a wonderful gathering of photographic intellect. If you’re not in…check ’em out! Anyway, there was a request for some info on fashion lighting set-ups. Specifically how to get a nearly blown-out white background with the edgy, contrasty light you often see in fashion layouts. Honestly – that lighting is deceptively simple to get close, but refining it can take a long time to perfect…I don’t really think I’m there and I’ve been studying it for a few years now. The basics of this look can be had with just two lights and a few black panels. 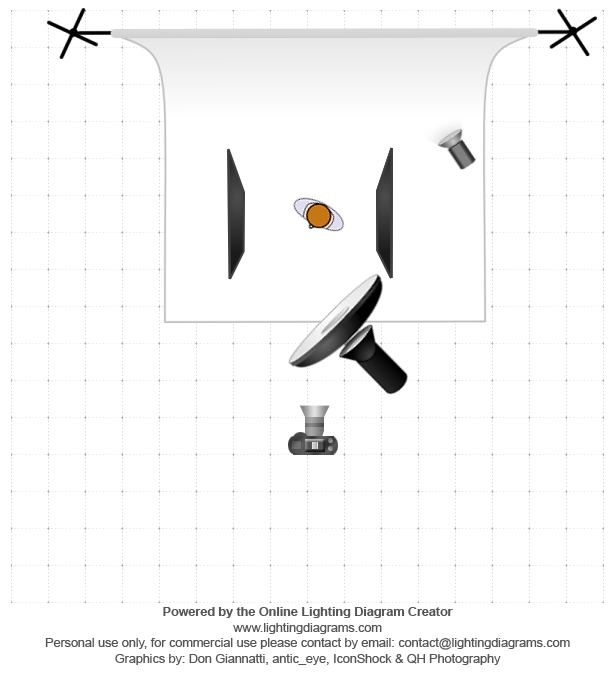 The lighting diagram here shows the overhead view of the set. Note that the main light source is a strobe with a beauty dish & diffuser. I used a basic 22-inch dish, but the pros swear by the 28″ Mola dish. 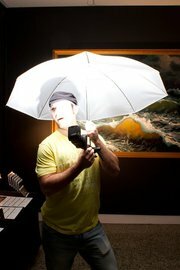 The main thing to note with whatever you use – the center point of the light beam is NOT aimed directly at the subject. If you look carefully at the diagram you’ll notice that the model is in the “feathered edge” of the light. This prevents you from having an extremely harsh highlight right on their forehead and nose. The light was raised above head height – probably about 8-10ft. This is the part that takes a long time to really perfect…you’d be amazed at how much difference you get by shifting the placement and angle of a light just a few inches. The background light is really pretty straightforward. Light up the background if you want it white (technically, you should try for about 1-2 stops exposure above your subject…). I’ve found it faster personally to just use the screen on the back of my camera to judge whether the light is too bright. Make sure to zoom in a check the edge detail of your subject – if you’re too strong on the background light you’ll start to lose edge detail. Of course, if that’s the look you’re going for, by all means break this rule. You’ll also notice in the sample images below that I have a grey background and one that is black. These were all set up in nearly the same fashion, but I just used the key light for the darker backgrounds. To make it go black you just have to make sure none of the light is falling on the background…distance and angle are the keys. I use simple black foam core panels set at different heights on either side of the subject to deepen the shadows on the sides. This is one of those little ‘secrets’ that makes small but noticeable differences in the image…and again, you have to play with the placement until you find what you like. I usually have them about 3-4 feet away from the model. So…that’s a brief introduction to the lighting set up. If you’re really limited in what you have available to shoot with as far as lights and modifiers – you can try a few tricks to get close to this arrangement assuming you have at least a nice clean white wall. Try to get your hands on a slave-triggered flash in addition to one that will mount on your camera. 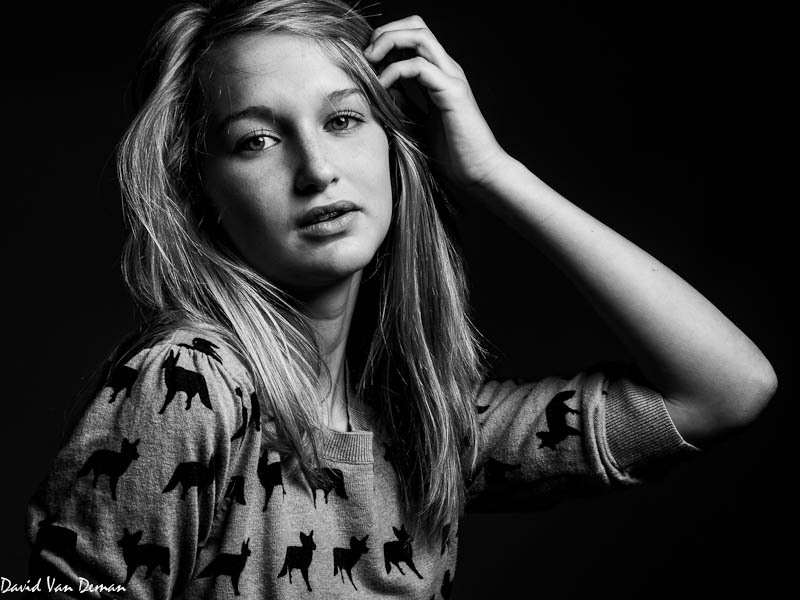 Cheap is sometimes just fine…I’ve used these as slave flashes with great results. The main requirement is that it has a slave mode that will fire when it senses the light from another flash. Use a white panel above you and off to one side or another to bounce your on-camera flash toward the model and act as the key light. Your slave flash should trigger and light up the background wall. You will really have to tinker with your settings to pull this off and get the lighting balanced out, but it should get close to the right look. Another little tidbit – I always shoot fashion shoot in the monochrome (black & white) setting on my camera using RAW files. This let me balance out the highlights and shadows a lot easier and if I’m getting the contrast that I want in black and white, I know it will convert well into a color photo once I load it into Lightroom. Full Disclosure: This was actually a little off-the-wall post I wrote up on Facebook a few years ago before this blog was active. I just came across it again and had to share. Enjoy!! 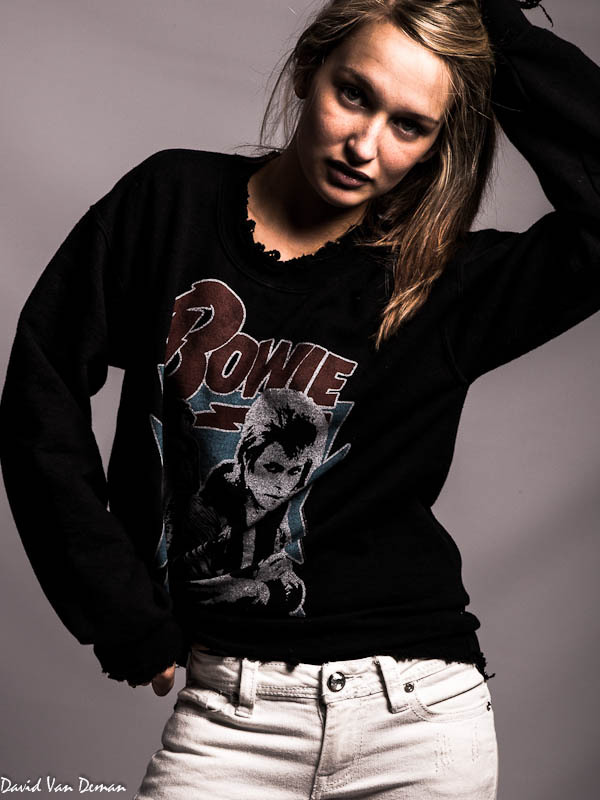 Well, I’ve spent a long day editing photos for the April edition of Fashion Wrap Up…It was certainly crunch time!!! The studio shots took a little more time than I was anticipating to get them all cleaned up, but I think everything turned out pretty darn fabulous after all. Anyway, this little post really came about because I was asked to dig back into my archives of images for one of the featured designers – the fabulous R. Lynda from the December issue. While sorting through the images I came across this pic. It’s really one of my favorites just because of the fact that it is totally NOT a fashion shot. One of our favorite male models, Casey, was helping me out as a photo assistant for the day (he also helped us scout out the location for this shoot). In between sets, I caught him goofing around with my flash and umbrella…and me being the jerk that I am…I took the shot. Obviously, this lit up the inside of poor Casey’s skull for an instant…the evil imp in me laughs. Believe me, I’ve fired these things into my own face more times than I care to admit…so I do know what it’s like. So what’s my point? I dunno really. I just really enjoy seeing this picture because it reminds me of one very fun (and for Casey…painful) moment during one of the many fashion shoots I’ve done in the past year. I thought everyone might enjoy sharing a little.